Wow! 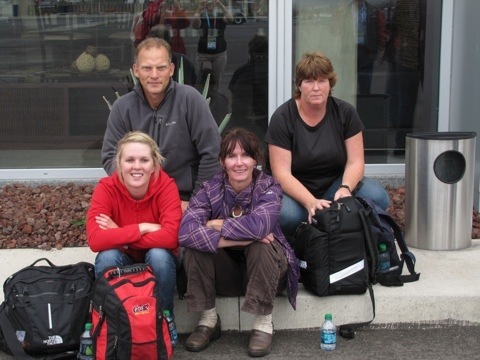 It’s been a whirlwind of activity since Tina and I landed in Mexico. 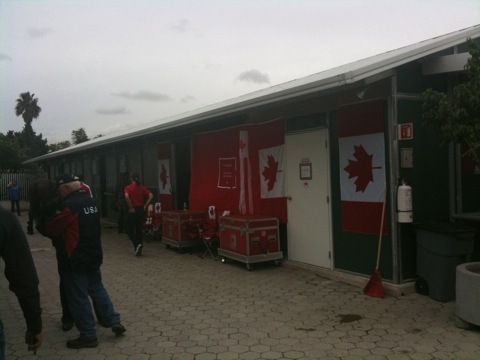 First on deck was to meet with COPAG Equestrian Director Mauricio Guerra to get an update on the Pan Am preparations. Mauricio took us on tour of the Guadalajara Country Club where last minute construction is still underway. They have really put in considerable work since I was here in June for the Test Event, including improvements to the footing and the construction of additional rings. 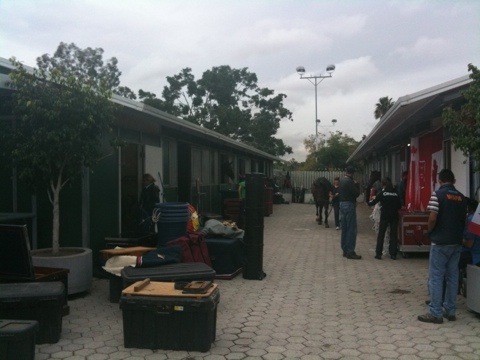 The Dressage horses arrived Tuesday afternoon, with all of us feeling anxious about the weather reports about Hurricane Jova. 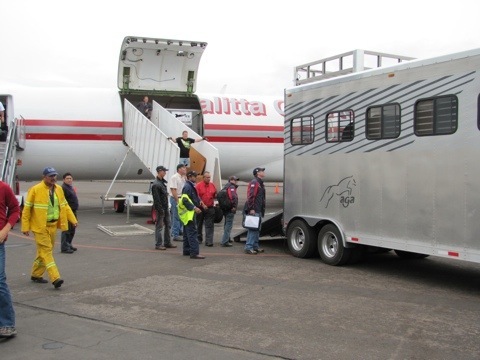 Tim Dutta kept all of us updated throughout the entire day, from the morning when the horses left Pre-Export Quarantine, to when they loaded onto the plane in Newburg, NY, to the touchdown in Dallas for refueling to their departure for Guadalajara. By all accounts, it was an uneventful flight with a bit of bumpiness near the end. 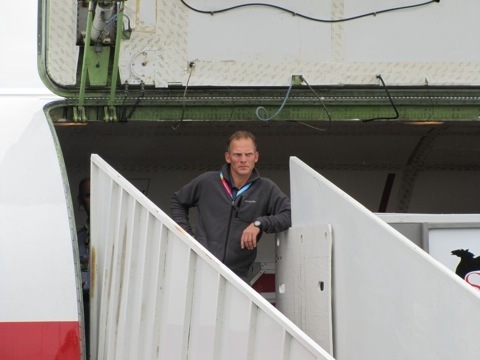 Tom Dvorak did describe an anxious moment when the planed suddenly dropped in altitude due to the turbulence, and at least one horse momentarily experienced zero gravity….but all horses arrived happy & healthy. It always amazes me just how incredibly trusting horses are and what they are willing to tolerate. The flight was only about 10 mins late. 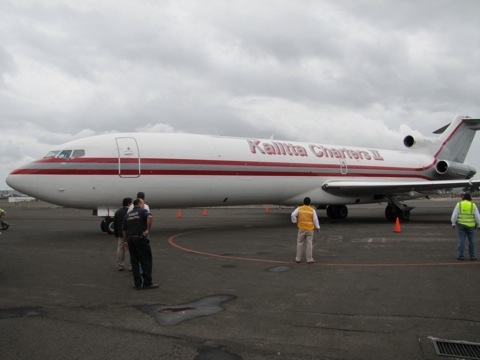 It taxied into Aerotron just after 2:30pm….this is a private hangar who are a bit more used to celebrity arrivals such has Lady Gaga and the Manchester United football team as opposed to four-legged celebs. 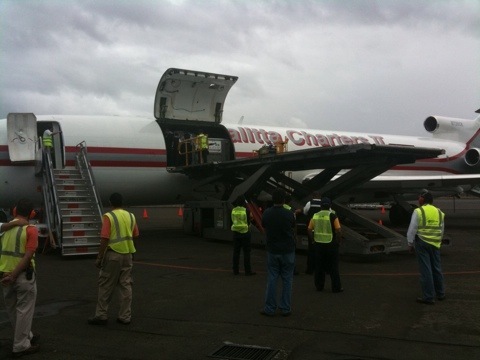 The equipment was unloaded from the plane by 3pm. still unloading the equipment. This was very fast. Tina and I handed our grooms/athletes/vet their activated accreditation cards. 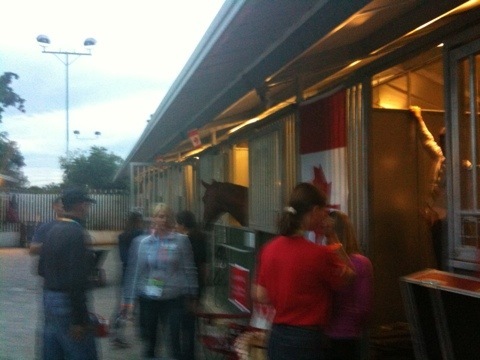 Horses were loaded onto the trailers first, then equipment was loaded. By 5:15 pm, we were on the road with the horses. rear)…our car followed immediately behind our trailer. Our Dressage team worked hard to get their stable area all decked out in Red & White so there’s absolutely no mistake whose aisle you are in. This included some wonderful custom made stall signs, which will be a brilliant keepsake after the Games. I can just see them now in a framed shadowbox looking very sharp next to a Pan Ribbon and Medal. All the horses continue to do well, and tomorrow the sun is finally meant to make an appearance for the first training session. Jog takes place on Saturday morning. Let the Games begin!.